LONDON – A man who became known as the “British Schindler” for saving hundreds of Czech children from Nazi persecution in the run-up to World War Two, has died at the age of 106. 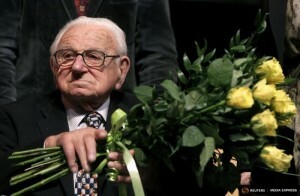 Nicholas Winton died July 1 with his daughter Barbara and two grandchildren at his side, according to a statement from the Rotary Club of Maidenhead in southern England, of which he was a former president. Winton had worked as a stockbroker before heading to Prague in 1938 to help with welfare work for Czech refugees and was 29 when he masterminded the rescue of the children. Winton’s wartime exploits, however, remained a secret for years until his wife Greta found a detailed scrapbook in their attic in 1988. He had not even told her of his role. “You can’t come up to somebody and say: ‘by the way do you want to know what I did in ’39?’ People don’t talk about what they did in the war,” Winton told Reuters Television in 2009. Over the years, Winton’s work had been recognised with various awards and with a small planet discovered by Czech astronomers named in his honour. The Rotary Club quoted from a 1939 letter in which Winton had written: “There is a difference between passive goodness and active goodness, which is, in my opinion, the giving of one’s time and energy in the alleviation of pain and suffering.